Mara Rockliff's two most recent picture books for kids are Around America to Win the Vote and Anything But Ordinary Addie. Her many other children's books include The Milo and Jazz Mysteries, Mesmerized and Gingerbread for Liberty!. She lives in Eastern Pennsylvania. 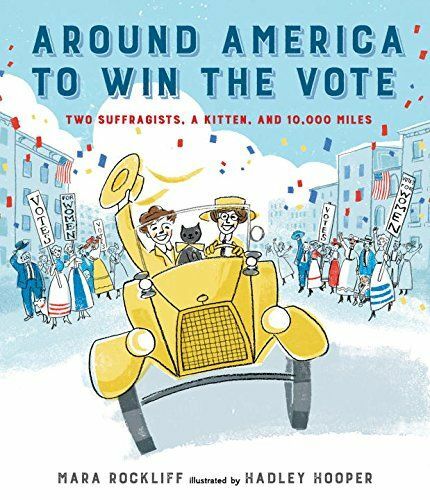 Q: Your new book Around America to Win the Vote is based on the story of two suffragists who drove around the country in 1916. How did you hear about their story, and how unusual were they for their time? A: I came across their story in a series on the Smithsonian blog written by Patri O'Gan, and of course I was immediately charmed by the two women and the kitten in their little yellow car. How unusual were they? Well, on the one hand, this was only thirteen years after the very first cross-country road trip, so a pair of suffragists traveling 10,000 miles around the country ("alone," without a man!) was definitely newsworthy. There was no GPS, no road maps--sometimes there weren't even any roads! On the other hand, suffragists in general were very brave, resourceful people who routinely did amazing things to draw attention to their cause. In fact, that Smithsonian blog story was part of a series about epic suffrage journeys. Women pilots flew for suffrage; others traveled by rail, by yacht, on foot, even by oxcart! So in that sense, this trip wasn't unusual at all. Q: How did you research Nell Richardson and Alice Burke's journey, and what surprised you most in the course of your research? A: This topic was enormous fun, because it was uncharted territory. Nobody had ever researched it in depth before, so it was pure detective work. Almost all my information came from newspapers around the country who reported on their trip, including a handful of articles that Alice wrote herself. I used these articles to map their route. 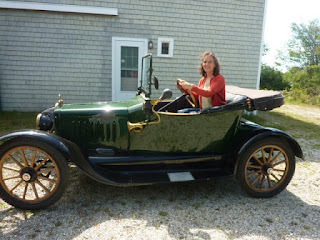 I think my most remarkable experience was when I had the chance to drive a one-hundred-year-old Baby Saxon, the same kind of car that Nell and Alice drove. I've never been particularly interested in looking at antique cars, but actually driving one is a whole different story! It was terrific fun, and surprisingly easy. Q: You also have another book out this year, Anything But Ordinary Addie, about a famous magician, Adelaide Herrmann. How did you learn about her, and were there many women magicians in her day? A: Addie was a little different than my other books, because I didn't just stumble across her story. I'd gone looking for a book about a woman magician for my daughter, and I couldn't find one, so I decided to write one. 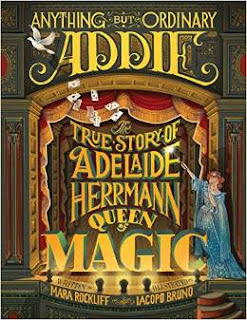 I was incredibly lucky because Addie's memoir had JUST been privately published by magician Margaret Steele. If I'd gone looking for a woman magician only a month or two earlier, I wouldn't have found Addie--and she was one of a kind. I don't know of any other woman magicians of her era, let alone any who wore snakes around their necks or agreed to be shot out of a cannon! Q: You write, "Generations of girls grew up thinking all the great magicians had been men." Why was Addie's story not better known? A: This is actually something I've seen again and again, not just in the history of magic but in music, journalism, film, activism--you name it. In all these fields, there were outstanding, accomplished women who were well known, even famous. If you go back to the primary sources--interviews and memoirs--you see them mentioned with respect and admiration by the men they worked with and influenced. In Addie's case, Harry Houdini was a fan! But later, when the histories came to be written, these women were simply written out. A: I've got five or six more historical picture books on the way, including one about the pioneering film director Alice Guy Blaché and another about Lil Hardin Armstrong, an early jazz musician, band leader, and Louis Armstrong's second wife. Both of them were fabulous, colorful characters, a lot of fun, and definitely worth getting to know!